Blog — Stevie Storck Design Co. It's pretty common knowledge at this point that I love shopping secondhand. Most items in our house were found at a thrift store, yard sale or online classifieds like Craigslist or Facebook Marketplace. There are many reasons to love thrifting; whether it's the thrill of the hunt, trying to be mindful of consumption in regards to sustainability and the environment, or as an affordable way to outfit yourself and your home. My reason for thrifting is a combination of all three plus I love to decorate my home with unique items that no one else has. I've been a thrifter since high school and I am often asked how I find such good stuff secondhand. I wrote this post to share what I've learned over the years and my best tips for thrifting housewares and home decor items. Every item in this photo is a secondhand find with the exception of our dining chairs. For smaller home decor items and housewares, I find that thrift stores and yard sales are really the best place to shop. For bigger items, I'm a fan of Facebook Marketplace and Craiglist (I'll be sharing my tips for shopping on those sites soon!) but in my experience the best prices and selection on smaller home goods aren't going to be found online. Familiarize yourself with the secondhand shops in your area and go frequently. People have told me that they would love to thrift but just don't have the time. Thrifting doesn't have to be super time consuming! After you've been to all your local spots once, you'll know which ones are worth making return trips to. I try to squeeze in a little thrifting if I'm out running errands and I'm going to be nearby one of my favorite shops. I don't spend hours shopping or look through every section every time I go. I've decided on certain parameters for myself that help narrow down what I'm looking for to save me time and make it more manageable to find what I'm looking for. So you can't really go to a thrift store once with a list and expect to find exactly what you're looking for. But I do recommend having an idea of what you might need or want for your house ahead of time for the simple reason that thrift stores are crowded and you won't see what you aren't looking for. Every time I think of something I could use for the house, I put it on a note in my phone. Right now on my list are new cereal bowls and wooden peg racks for our kitchen and laundry room. In addition to making it more likely that I'll find what I'm looking for, this list also helps keep me focused on buying things I could actually use. When items are priced at $0.99 it's tempting to just throw everything in your cart, but I'm still trying to be intentional about what I bring into our house from a clutter standpoint. And also, you're not really saving money if you're buying something you weren't planning to already, you know? That being said, there are some items that I always keep my eye out for because they are versatile for decorating and/or have some practical or organizational use. Pin this list to refer to the next time you're out thrifting! Another way I save time at the thrift store is by really knowing my style and the types of materials, patterns and colors I want to include in my home decor. I prefer natural materials like wood, wicker, ceramic, stone, leather, linen and cotton so I keep my eye out for those materials whenever I'm out thrifting. I like classic patterns, like stripes, plaids, gingham and vintage florals. I also have narrowed down the color palette I buy for my own house, sticking to mostly neutrals like white, cream, tan, brown and black with some blues and greens. For wood, wicker and leather I stick with medium red-brown finishes. For metals, I mostly buy brass and black. For you, it might be light/blonde wood finishes, warm colors, and copper metallics. Whatever your style is, coming up with a palette that you stick within for your home will make it easier to narrow down the selection while shopping secondhand and will also help your house feel more cohesive, and not like a thrift store itself! Thrift shopping has become a big hobby for me. In addition to being an affordable and environmentally friendly choice, shopping secondhand for home decor has helped me to refine my personal style and create a look for our home that's collected, eclectic and feels unique to us. If you've never tried thrifting before, I hope this post inspires you to hit up your local stores! And if you are into thrifting already, I hope my tips help you find more of what you're looking for. Do you have any thrifting tips to share? What's your favorite thing you found at the thrift store lately? Comment below or join the conversation on Instagram. Once you've decided to start a redecorating project, it's hard to resist the temptation to start shopping and ordering right away. But shopping without a plan is a surefire way to end up over budget and with a room design that isn't as functional or cohesive as you'd like it to be. You know the saying "You can't see the forest for the trees"? Sometimes our rooms can be so full of stuff that it's hard to envision it being anything else. By taking the time to clear out the clutter first, you'll be able to see your space with new eyes. Consider parting with any furnishings that are in bad condition, aren't as functional as they could be for your lifestyle or that you simply don't love anymore. Small accent furniture and accessories in good shape can be donated, consigned or sold on Craigslist right away. Save the money you make towards your decorating fund! If you are planning to sell larger pieces like a sofa, chair or media cabinet, go ahead and take photos and measurements of them now, that way you are ready to list them when your new furniture arrives. Now that your room has been pared down to only the pieces that you intend to keep, brainstorm some new furniture arrangements! Sketch them on some paper first, or if you are more the spontaneous type, just start moving things around! (I usually just wrestle with the furniture myself, but at my latest install we used these. So much easier!) Test out a layout you've never tried before. Maybe try moving the sofa across the room to sit in front of the windows, or try bringing in the arm chair from your bedroom and the bookshelf from the basement. Now's the time to experiment! Use what you already have to see what layout feels the best to you. The best way to save money on a decorating project is to start with things you already own first! It can sometimes be hard to analyze the "big picture" of a room while you're standing in it. Use your phone to capture an image of each wall, and then two or three overall room shots. Now that you can see the room in a "bite-sized" format, what's missing? Is there a big empty space between the sofa and the chair that a side table or ottoman could fill? Is your coffee table the right size and shape for this new arrangement, or do you need to go bigger or smaller? Where are the natural focal points? What can you do with art, accessories and lighting to make these focal points even more special? Put your designer hat on! Brainstorm some ideas that you can sketch into a notebook to take with you when you shop. While you're at it, take some overall dimensions of the room to jot down in that notebook too! I guarantee you'll find shopping so much easier when you have your notes and room photos to reference! If you ever see me out shopping, chances are I'll be standing by some piece of furniture or art, holding up my phone and just staring back and forth trying to really envision that item in the room I'm working on. With a little imagination, it's the quickest way to "try it before you buy it". Now organize that brainstorming into your shopping list. Start with the big pieces, like upholstery, side tables, coffee tables, storage and media cabinets. Since you've already determined your new room layout, next to each piece write the general dimensions that is has to be to fit in the space. I usually write the ideal dimensions, but also the maximum dimensions that will fit. That way you don't have to second guess yourself if you find a great bargain on a piece that is just slightly bigger than you were looking for. For sofas and chairs, make sure you are accounting for enough room for end tables plus a little breathing room. You don't want everything sandwiched so tightly together that the end tables are rubbing up against the walls. For storage pieces like bookshelves and media cabinets, make sure to measure from the inside of any door or window trim. Ideally you want to leave room for curtains to be hung high and wide, but you especially avoid having wood furniture that overlaps or covers the wood casing. That's a small detail, but it's something that can really make the proportions and scale of the room feel out of whack. Even at this early stage of the design process, I am always thinking about 1 or 2 Key Accessories that will really set the tone of the finished space. You may not have decided on a color scheme or overall style yet, but you do know where your focal points are. Take some time to measure these wall spaces to determine the ideal and maximum dimensions of the artwork you plan to hang. If you are planning to style the bottom shelf of your media cabinet with large woven baskets, measure the height, depth and width of the space where those will go. You'll save yourself from having to return too big or too small items, because you'll know exactly what size to look for before you even step foot into a store. Now that you've prioritized what to furniture to buy and exactly what to look for in each piece, you're ready to start shopping! If it's not on the list, don't buy it! Aside from your 1-2 Key Accessories, save small items like trays, vases, bookends, sculptures, plants, etc. for after you have your new furniture in place. You'll have a better idea of what you need after you see the room starting to come together. As a designer, I have a relative idea of how much things cost depending on the quality and style I'm looking for. Most people only purchase furniture every 7-10 years, so if you fall into that category or if this is your first time buying furniture, spend some time researching pricing online before you shop to familiarize yourself with what price ranges furniture is selling for today. You'll avoid sticker shock and be able to pin point stores and retailers that meet your budget and style needs. Here's how I determine a reasonable and realistic budget for my client projects and my own decorating projects: Next to each item on your list, write the least expensive price you saw online and the most you would be willing to spend on that piece. Then add up the low prices and the high prices to come up with an overall budget range for your project. You decide where in that range you feel comfortable, then set the final budget and stick to it! Making a detailed shopping list and setting a budget before you shop will save you time and money by keeping you FOCUSED. If you are in the process of redecorating your living room, I hope you found this post helpful! You also can (and should!) apply these same steps to any room project you're working on. For dining rooms and bedrooms, you just won't have to spend as much time playing around with different layouts. My quick rules of thumb are centering dining tables in the room wherever possible and placing the bed on the wall you see first as your enter the room. The rest of the the furniture placements fall into place after that! Want more budget decorating tips? Stay up to date with the latest posts from Stevie Storck Design Co. by subscribing via email and/or following me on Facebook or Instagram. I hate spam and promise to keep your contact info safe. Thanks for subscribing! So glad you decided to stop by. If you have any design questions, comments or general inquiries you can reach me at stevie@steviestorck.com! Thanks again, friend! Thrift stores are a budget decorator's best friend. 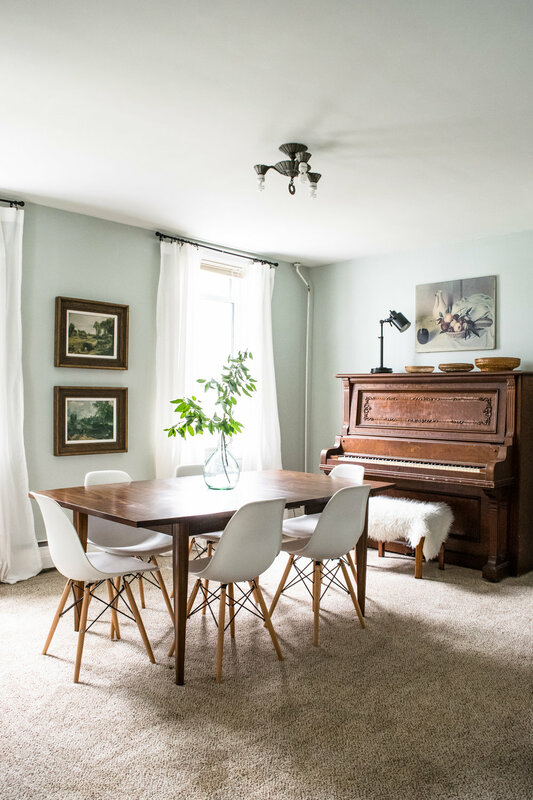 Pinterest makes it all look so easy-- from thrift store furniture makeovers to buying valuable vintage pieces at a steal. In reality, second-hand shopping savvy is a skill that takes some practice! If you're frustrated about repeatedly coming home empty handed from your thrifting attempts, this post is for you! If you're new to the blog, let me start by saying that I'm all about creating a beautiful home without blowing your budget. Click here to read one of my most popular posts, How-To Furnish Your First Home Without Going Into Debt. I'm often asked by friends and family members how I manage to score such awesome thrift store finds when all they see is junk. Well, I'm here to tell you it's not some special gift I was born with. My second-hand shopping success can be boiled down to these 5 tips I'm about to share with you. Read on to learn how to better shop a thrift store and find the best used furniture deals. At this point, I have a regular thrifting route of local shops that are my go-to's. You'll always find the best deals at places like Salvation Army, Community Aid, Habitat for Humanity Restore, and any local thrift stores and salvage shops in your area. The next tier would be consignment shops (here in York we have Finders Keepers!) whose prices are a little higher but they are much more selective about what they accept so you have a better chance of finding something good. After that, I'll stop by more boutique-style resale shops and antique stores that may have a selection of booths from different vendors. These shops are the most curated, and therefore have generally the highest price tags when it comes to secondhand furniture and home decor. But you'll still pay way less than what you would new and more importantly, you save time in looking. I usually fit in thrifting when I'm out running other errands, or when I have a couple hours free during the day. But if you are new to thrifting and planning to visit a bunch of new stores, I would recommend doing a little research ahead of time. Thrift store hours can be weird, so always check what days and times they are open before you go! Calling ahead to see what day new items arrive, or if they have any weekly specials (like 50% off Wednesdays) can also help you plan your trip. Of course, there are also online options, like Craigslist and now Facebook Marketplace which I've had great luck with as well. Those I tend to check anywhere from a couple times a week, to daily depending on if I'm actually looking for something or not. When I'm shopping at locally, I usually make two loops around the store, the first one focusing on big items like upholstery and wood furniture and the second focusing on "smalls" like lamps, accessories and artwork. I make a mental note of items I like, but I don't make any decisions until after the second loop. By that time, I've seen hundreds of pieces, so if I am still thinking about one or two in particular then I take that as a good sign I should buy them. When I'm shopping online, I have a few tricks for finding the hidden gems. First, you want to know which categories to look in. You might think that area rugs would fall under "Furniture", but some sellers list them under "Household". On Craigslist specifically, I will usually browse Furniture, Antiques, Household, Free and Arts & Crafts in that order. I also filter the results by checking the boxes for "has image" and "posted today" whether I've searched for a specific item or am just browsing a whole category to save myself some scrolling. When typing in search terms, it's good to try out a few different options since many types of furniture can be called by different names. General terms often cast the widest net and help you find the diamond in the rough. You might be looking for a midcentury modern teak dining table, but if a seller has those words in the listing that means they know what they have and are probably charging a premium price for it. You're looking for the grandmas and grandpas cleaning out their basement and having their teenage grandson list the items under simple words like "table". Tip: Know the store's pricing policies before you go. Generally, at thrift stores and consignment shops the pricing is firm. Some antique stores will let you negotiate, especially smaller ones but at larger ones with multiple vendors it can be tricky. If you're shopping on Craigslist or Facebook Marketplace, definitely negotiate!! If you think something is overpriced, point out why and offer them what you think it's worth. Even if the asking price is fair, I usually start by offering around 80%. The worst they can say is no. Check for shop marks in common places, like inside drawers or on the bottom of a piece. If you find a name, do a quick Google Search on your phone to learn more. "The Jiggle Test". Test out the construction of any piece by giving it a light jiggle. This works for wood and upholstered pieces,which have wood frames underneath the layers of fabric and cushioning. If a little movement makes the piece feel unstable, or if you can hear a lot of creaking and loose joints (called "racking"), I would probably pass on the item unless you want a project! Pay attention to the details, like if the piece you are looking at has drawers check to see if they are dovetailed. They are usually the most visible joinery in a wood piece and are a sign of quality in construction. Look at a piece from every angle, open the doors, sit on it (if it's something you would sit on! ), see how every part and feature functions to get a good idea of what condition it's in and if you would need to put any work into it. The number one reason I have success with second hand shopping is that I do it frequently! Sometimes I'll find nothing, and other times I'll have a whole carload. That's just how thrifting works. When I am specifically in the market to buy something, I shop the same couple of stores up to 3-4 times per month. Even when I'm not, I go about once a month just to see what new. And like I said before, I browse online anywhere from a few times a week to multiple times in one day. No matter what anyone tells you, there are really no "good" thrift stores. It's always a gamble whether you'll find something or not, so if you're hoping to furnish your house with mostly secondhand pieces then thrifting has to become a part of your lifestyle! What tips do you have for thrift store shopping? Did you score something awesome recently? This post was updated in March 2018, originally published in March 2016. Update August 2016: "How To Furnish Your First Home Without Going into Debt" was published by The Huffington Post!! See the feature, here. When we bought our first home this past spring, we moved from a 1-bedroom apartment with approximately 600 square feet. Needless to say, the little bit of furniture we owned didn't go very far towards furnishing a 4-bedroom, 2,210 square foot house. There's no rule that says your house must be completely furnished 6 months, or even a year after you move in. A house is a longterm commitment. Slow down and let your decorating happen at a relaxed pace. Number one: you'll have better ideas because you won't feel so rushed and number two: you'll give yourself time to save up for big purchases. For us, our first priority was the living room since it's where we will spend the majority of our non-sleeping time at the house. After that it was the dining room and next up will be our master bedroom. Is this piece in good working condition? Does it fit my style and/or can it be modified with new stain, paint, knobs, etc. to work with the design I have in mind? Can I think of exactly which spot and in which room I would use it? I'm at the point where I can't even count the number of things in my home that I bought off Craigslist. Searching through new listings on CL is a much a part of my daily routine as putting on deodorant or checking my email. You can score absolute gems on Craigslist, but the key is patience and consistency. You may not find what you are looking for the first time on the site, but if you keep checking back over the course of a few weeks, your odds of finding the perfect piece are much better. Don't be afraid to negotiate price and of course, be safe! Research the neighborhood before you go, bring a friend, and try to schedule pick ups in during the daylight hours and in a public place if at all possible. Use your best judgment, if you are at all uncomfortable during your interactions online or in person with a seller, leave the situation immediately. While I get the majority of my casegoods (wood pieces) second-hand, there are two things I highly suggest saving up for and buying new: mattresses and your living room sofa. Aside from the obvious sanitary reason for purchasing a mattress new, did you know that the lifespan for most mattresses is only 8 years? Even if your old college mattress still feels semi-comfortable, there's a good chance that it's not giving your spine the proper support that it needs. None of us are getting any younger, so do what you can to avoid unnecessary back aches and discomfort while you still can! After your mattress, your living room sofa is probably going to get the most use out of any other furniture piece in your home. You don't want to go bottom of the barrel for this purchase or you'll end up with a sagging, uncomfortable sofa by this time next year. When shopping at furniture stores, ask about durability and how many years of use you can expect to get from the different sofa brands they carry. Avoid any 0% interest financing offers and instead ask if they offer a discount if you pay for your purchase with cash or check. It might not be a very big discount, but it will be even easier to relax on that new sofa knowing it is paid for in full. Are you trying to furnish your home on a budget? What is your favorite bargain purchase you've made so far? Share your answer in the comments below or tag me on Twitter or Instagram (@steviestorck)!